This story is about three dinosaur brothers, two stegosaurus and one stegoTHEsaurus. 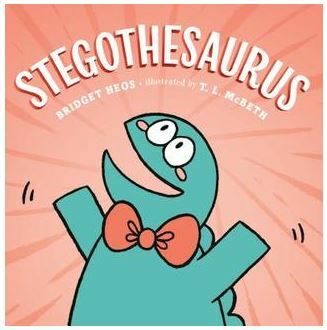 For every adjective his brothers use to describe their surroundings, the stegothesaurus uses at least three; because why describe shrubs as “yummy,” when you can call them “Savory, succulent, scrumptious?” One day, when the brothers encounter another wordy dinosaur, the Stegothesaurus learns to trust his instincts! It’s a quick, amusing read that encourages readers to express themselves in new ways. Verdict: This is a nice addition to a language arts lesson on synonyms, alliteration, or the introduction of writing tools like the thesaurus. Plus, there are dinosaurs! It has a place in classroom and public libraries.